Margo Tamez was born in Austin, Texas in 1962. Her parents, Eloisa Garcia Tamez (Lipan-Apache & Spanish Land Grant, Calaboz, Texas) and Luis Carrasco Tamez, Jr. (Jumano-Apache, Spanish) were born and raised in the Rio Grande Valley, married, and moved to urban areas to follow education and career pursuits. Raised in San Antonio, Texas during the Civil Rights Movement and growing up during the Vietnam era made lasting impacts on Tamez' sensitivity and responses to racism, inequity, and social justice. Her parents were challenged to find community in an urban environment that pressed its hostilities, intolerance and injustices upon non-white groups. At the age of seven, she received advice from her mother to use the education of dominant culture in order to find ways to voice the people's struggles. She completed two undergraduate degrees: Archaeological Studies (1984) and Art History (1985) at the University of Texas. Spending time away from the academy and working in the arts in various locations in the southwest and south had a strong impact on the shape of her work to come. 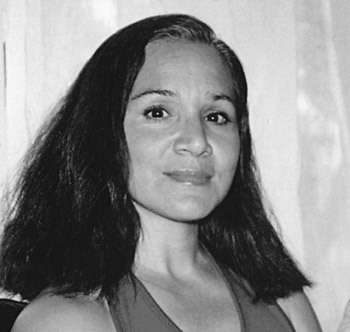 Her work with grass-roots poets John Trudell, Juan Tejeda and Raul Salinas, and deeply influenced by the folk singer-songwriter Butch Hancock, led to the publication of her first chapbook, Alleys & Allies (Saddle Tramp Press) in 1991. This collection was an early formal experimentation with oral tradition, the traditional 'corrido' from northern Mexico and south Texas, and social-political subjects. In 1997 she completed an M.F.A. in Poetry in the Creative Writing Program at Arizona State University, working closely with Norman Dubie, Jeannine Savard, Beckian Fritz-Goldberg, Alberto Rios. She is widely known for her work among traditional communities. Her work explores social themes that go against the myths and romantic notions of indigenous peoples. Her poetry and prose examines the erosion of social ties among Native families, personal vs. group sovereignty, gender sovereignty in the contexts of racism, classism and gender oppression within Native communities. She is widely sought after as a speaker who bridges traditional cultures, arts and humanities to social and policy sectors of society. She stresses the critical importance of the role of local communities and their participation as a resource and support for a more critical understanding of the dynamics of environmental racism and environmental in-justice in rural indigenous and poor people of color communities. In 2003, the University of Arizona Press released her first full-length collection of poetry, Naked Wanting . Two books are forthcoming in 2006. Raven Eye (University of Arizona Press, Sun Tracks) a poetry collection, is a testimony of internalized racism with Native communities, and the thrust of violence perpetrated upon the most vulnerable. The Daughter of Lightning (Kore Press) is a collection of essays relating stories of chemical, petroleum, DDT, and toxaphene exposures in indigenous communities in the south Texas borderlands, as well as those of Gila River Indian Community and others in which she lived or worked. Margo co-organized, with Joni Adamson, the Symposium On Globalism and the Environmental Justice and Toxics Movement. Focusing on environmental justice, urban nature, and more specifically, grassroots activism that raises questions about the effects of globalism, corporate capitalism, and the unequal distribution of toxic sites in the environments of the poor and people of color communities. Seeking to establish the relationship between the writing and literature of environmental racism, place and activism, and the contexts that inspire these writings. Currently a resident in Washington, she uses her own production (painting, photography, film, fiber media, mixed media) to inform her poetry and prose. Her writing focuses on contemporary indigenous women's narratives and cultural productions which interrogate and speak out on toxic environments and engage environmental justice strategies in borderland, transnational indigenous communities. Margo's awards include a Poetry Fellowship from the Arizona Commission on the Arts, First Place Literary Award from Fronteral Literary Review , Environmental Leadership Fellowship Award, Distinguished Achievement Award, and International Exchange Award from the Tucson Pima Arts Council and others. Naked Wanting (Camino Del Sol), University of Arizona Pr. Alleys and allies , Saddle Tramp Pr. Inez Hernandez-Avila (Editor), Univ. Texas Pr. [Forthcoming]. Storycircle: Women Write Project , [Forthcoming]. Sister Nations , Heid Erdrich and Laura Tohe (Editors), New Rivers Press. Stories from Where We Live: The Gulf Coast , Sara St. Antoine (Editor), Milkweed Editions. Feathers, Fins & Fur: Animal Stories , Outrider Pr. Southwestern Women: New Voices , Caitlin L. Gannon (Editor), Javelina Pr. This is an "official" site in that this page was constructed with the assistance and active collaboration of the poet, Margo Tamez.